 <29-Jun-02>: The Train-sim.com message area some time asked MSTS simmers for ideas on improvements for the next version. You can find a summary of suggestions at www.otto-wipfel.co.uk. Noticed in the Train-Sim.com file library: an update to the Rio Grande Zephyr trainset (rgzupdt.zip, 10.2Mb, 27-Jun-02) and a refurbished Series 30000 trainset, including custom cabview (s30000.zip, 1.7Mb, 27-Jun-02).  <28-Jun-02>: Barry Andrews' transparent popup files are now available in trpopups.zip (335kb, 25-Jun-02) at the Train-Sim.com file library. Now when you pause MSTS with ESC or F2 to consult your printed map, you can still see from your cab, or other current view, where you are. Also, Gavin Mclaughlin has modelled the VR and V/Line grain hopper wagons (vhgy.zip, 1.4Mb, 26-Jun-02 in the Train-Sim.com file library).  <25-Jun-02>: A few days ago webTrainSim updated ActivityChanger from V1.1 to the latest version, V1.4a. You can download this useful tool to add variety to activities at msts.juliane-und-torben.de. Another improvement to the driver aids is trakmon.zip available now at the Train-Sim.com file library. Keep an eye out for Barry Andrews' Transparent popups (trpopups.zip) to appear in the Train-Sim.com file library in a day or two - some may have read Barry's explanation of how to do it all on the message board; but he's done all the work for us with this download. Waiting to get to Joshua's Cradle platform on the Full Bucket line.  <24-Jun-02>: The BNSF Air Brake & Train Handling Rules have plenty of good ideas for MSTS, as well as being BNSF's official operations guide for its engineers. Find out how to start your train on a level grade, uphill and on a descending grade. As well, find out how you should be handling the throttle, air brakes and dynmaic brakes on your locos. Just seen the Train-Sim.com file library are these Australian classics: Victorian Rail Y-class #164 loco, y164.zip and NSWGR Railmotor set, au620720.zip. For those who know their U.S. train history, will want to know that the Erie & Lackawanna Phoebe Snow trainset is now available from the Train-Sim.com file library. Meanwhile, webTrainSim is back to studying "Brakes 01". Easing into Simonville on the Full Bucket line.  <23-Jun-02>: webTrainSim has installed the Full Bucket route (v1.0) by Bjoern Arlt. As a download from the Train-Sim.com file library (fbline.zip, 9.6Mb, 12-May-02), it's quite manageable over a dial-up line. Remember to also download a small update (fbl_fix2.zip, 28-May-02) as well. Bjoern has made the installation a very simple process - just follow his instructions in the readme and you'll be away in no time. Full Bucket is a fictional route, set in a desert-type landscape, and is well-suited to running Australian rolling stock such as the Pilbara iron-ore trains. Bjoern is currently working on version 2 and he's recently posted some screenshots on the Train-sim MSTS message board.  <21-Jun-02>: The installation of a cab (by NALW) for the DDA40X UP Centennial loco has been concluded after a kind visitor pointed out webTrainSim had left the job half-finished from some time ago. Just seen in the Train-Sim.com file library: Joseph Spinella's La Perouse tram line from Circular Quay to La Perouse in Sydney (laperous.zip, 15Mb, 20-Jun-02). That's why Joseph designed the R Tram (rclass.zip, 4Mb, 01-Feb-02). ConBuilder reports that webTrainSim now has 205 locos and 185 wagons (freight cars) and carriages (passenger cars) in the roundhouse.  <20-Jun-02>: Those of you wanting the 3DTrainstuff SD70 cabview can rest easy (3DTrainstuff removed it from their site some time ago). This popular cabview is available as sd70ali.zip from the Train-Sim.com file library (with permission from the 3DTrainstuff team). 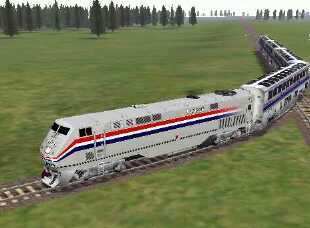 Amtrak P42 #18 with 4 Superliner coaches stuck! The moral of this story: when exploring, use equipment suited to sharp turnouts!  <19-Jun-02>: You should be well on your way to working through Barry Andrews' air brakes tutorial by now. One document worth getting from one of the links on Barry's page is for the BNSF Air Brake & Train Handling Rules. You'll recognize some of it as being in the MSTS help docs. Click here for the BNSF doc - it's in PDF format so you'll need the free Acrobat Reader. For a whole range of railway technical information, visit www.trainweb.org/railwaytechnical/. Finally, don't forget Al Kruga's site at www.vcn.com/~alkrug/rrfacts/ (Al is a practising U.S. engineer with BNSF). For more information, see the reference section of the sites page.  <18-Jun-02>: Barry Andrews' Understanding air brakes in MSTS is available for download at Train-Sim.com - look for brakes01.zip. Barry discusses air brakes in a practical manner, using the default GP38 loco as a working example. webTrainSim also noticed the Japan 3 Route with Maglev japmag.zip (13Mb, 16-Jun-02) and the Rio Grande Zephyr trainset rgz.zip (13.2Mb, 16-Jun-02).  <17-Jun-02>: The Class 220 Voyager DEMU of Virgin Railways voyager.zip (15-Jun-02, 7.1Mb) with custom cab is the highlight of the latest releases at the Train-Sim.com file library. For those of you interested in increasing your roundhouse of European locos and rolling stock, there is an increasing range of Italian rail units becoming available. The screenshot of the T320 cab above shows the challenge of driving with longnose forward. webTrainSim is using the GP7 cab, available in gp7cab.zip (17-Nov-01, 2.6Mb), for more realism.  <16-Jun-02>: Having installed Gavin Mclaughlan's VR T-class locos, there's a section here for some changes you might like to make for more realistic performance and driving experience using a GP7 high-nose cabview.  <15-Jun-02>: More Australian rolling stock now available at the Train-Sim.com file library: VR ZLP guards van zlp.zip, VR ZL guards van zl_van.zip, "M" stock wagon m_stock.zip, VR T-class locos T320 & T322 vr_ts.zip (all by Gavin Mclaughlan) and VR ZD brake van (1879) zdbrake.zip (by Ben Shields).  <14-Jun-02>: The page describing free Australian MSTS add-ons now has a better list of locos, rolling stock and sites. In the Train-Sim.com file library: Kurt Kaminer's BNSF GE-B40-8 #8608 klwb40v2.zip (4.4Mb, 13-Jun-02), BNSF #8608 blank TGA templates b40paint.zip (186kb), TS Terraform V4.7.1, the software that enables a route designer to create landscapes from DEM files or by tracing map countours, tstf471a.zip (1.7Mb).  <13-Jun-02>: webWiz took the opportunity to download the following files from Train-Sim.com file library the other days: Eurostar cabview version 2 (for Chris Longhurst's Eurostar) eurocab2.zip, Amtrak express box car amtk_box.zip and TSM CN RoadRailers cnroad.zip. Of interest were a cabview for British Rail/Southern Rail Mansell 4-4-0 Schools Class V locos schcabv1.zip and Route Optimizer, a utility to save disk space for non-commerical add-on routes routeopt.zip.  <11-Jun-02>: gmax is a free 3D modelling package and Microsoft have released the MSTS Game Pack (with demo loco) to work with gmax for those who want to start designing their own locos and rolling stock. The sad news for dialup users is the size of the download files for gmax. These items in the Train-Sim.com file library have caught webWiz's eye: Kurt Kaminer's F7/E7 cabview (klwf7cab.zip 3Mb, 09-Jun-02) and the fantasy SeaView Route Version 2 (seaview2.zip 28Mb, 08-Jun-02) by Bill Burnett.  <10-Jun-02>: Now available is a page that describes how to go about incorporating a passenger view, accessible from the 5 key, into your locos. Following Barry Andrews' post to the Train-sim.com message board a while ago, More GP38-2 cabviews will get you started. Barry's tips include how to have sound in the view.  <09-Jun-02>: Above is another version of improved driver aid monitors, this one by Adam Wojcieszyk (drvraids.zip, 177kb, 06-Jun-02 in the Train-Sim.com file library). Adam's used a transparent background for each aid (similar to what we see on TV for captians) to allow the text to show against any scenery or sky; he's also down-sized the icons. Chris Jennings has released updates to his NSW Inter City VSet in 3 different liveries and his CountryLink XPT train set. Both are available from the Train-Sim.com file library: crvset11.zip and clxpt1b4.zip.  <07-Jun-02>: Improvements to the driver aids continue... see drvraids.zip by Adam W. where he uses a "see-thru" type of background for better clarity. The Acela coaches have got a repaint (acelcars.zip) to go with the repainted Acela power cars - you might prefer to wait for the complete trainset. Finally, Route Riter has been updated to version 2.5 in rriter25.zip. Finally, the navigation on the left has been redesigned so it's more appropriate.  <04-Jun-02>: The see-through driving aids have sparked great interest with new ideas coming thick and fast. Follow the discussion thread at Train-sim.com. For some interesting documentation on BNSF's routes, particularly Marias Pass, see http://home.t-online.de/home/poetschke-schneider/bnsf.htm. Of particular interest: Glacier Park map bnsf.pdf, Montana division timetable, rules & distance to next station mont499.pdf, and BNSF Special Section Instructions (speed limits, loco data tables, dynamic brake requirements, etc.) ssi0400.pdf. As you can see all docs require the Acrobat Reader; thanks to Barry Andrews for the link.  <03-Jun-02>: Barry Andrews has made available 3 different methods for transparent driver aids. Method 3 is shown above where Barry has added some lines to divide the display for easier viewing. Download trnsprnt.zip from the Train-Sim.com file library. On the technical side, Peter Baker and Bob Boudoin have added updated locomotive physics (V4.11) for GE locos in 89gev411.zip from the file library. Route developers will be interested in the DEM write up in demtutor.zip - a good, practical working description of how to use DEM data.